Sorry for the lack of posts but I've been really, really busy helping out the cause in the blogosphere and exposing the lying liar which is John McCain and his sidekick Sarah Palin. For the latest example of the lies from the people who will do and say anything in order to get elected, click here. Trust me, there is MUCH more but this blog is designed to follow the lying lying ways of local government, not the national race. I'll be back shortly...but until my return, this little tidbit from the Maverick. On this day when we reflect on the tragic events of September 11th 2001, here's my thoughts on that event which I published back in 2007. 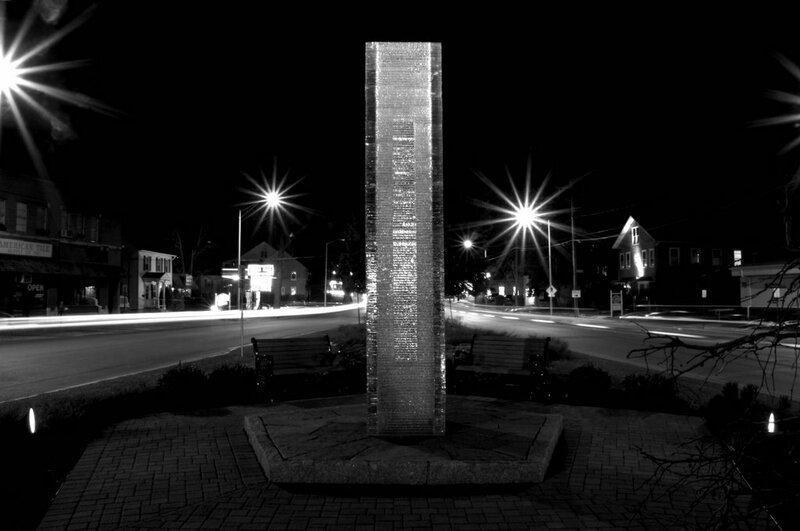 The City of Danbury's 9-11 remembrance ceremony will be at the memorial at Elmwood Park at 7PM. I remember that morning when I woke up, made my usual cup of coffee, walked outside to my porch and saw the clearest sky I've ever seen. As usual, I was running behind schedule and scrambling to get ready to work. While ironing my clothes, I was catching up with the morning news (I think I was flipping back between Good Morning America and Today) and laughing at the thought of my friends goofing on me when I walk into the office late. I can recall going for the remote and just about to press the power button when someone on television broke with the news that "something" hit one of the World Trade Center towers. Now, this happened about a quarter to nine and I didn't see the tower on TV when I turned it off...I just thought some small single engine plane hit the building or something. I jumped in my car and while I usually listen to Stern in the morning, I tuned to 1010 WINS to find out what was going on and that's when I first learned that something serious happened. By the time I made it to my job, the second tower was hit and it finally hit me...the country was under attack. I remember going into the office and seeing complete chaos. The internet being completely down (the WTC was a major hub for communications), people on their cell phones trying to get in touch with friends and loved ones who worked in the city, and work coming to a complete standstill. There was no way to get any information except for the radio (we had no TVs in the building) so people walked outside and hovered around cars listening to news reports. I remember the moment the first tower collapsed and my heart dropped as I realized that a friend of mine worked at the tower from time to time and none of my friends knew whether or not he was at the WTC on that day. He had a young son and a daughter on the way. I remember the horrible feeling of emptiness, a dark feeling you get when someone close to you passes away. That blank expression that people get when they’re hypnotized and you don’t know what to do. By late afternoon, I remember saying “the hell with this”, packing up my things, and left work. I couldn't get any work done...no one could get anything done on that day. My thoughts were on my friend, his family, and all those people who lost their lives. Driving around town, you could see that everyone had the same look of shock and disbelief on their faces. It was like, how could such a beautiful day turn into a nightmare? I pulled over to a restaurant that had a television and it was there for the first time that I witness with my eyes what I only heard on the radio and it made the situation even worse. The only bright spot of that day was the phone call I got telling me that my friend didn't have to work in the city on that day but he lost a lot of colleagues who never made it out of the building. Maybe I just wanted to share my feelings with someone who going through the same emotions right now as we remember those who lost their lives six years ago. Whatever the case, I know in my heart that I'll always recall that experience on that terrible day on every September 11 for the rest of my life. My heart goes out to all those who lost a loved on that horrible day in our country's history. I pray that none of us will never forget and pass on our experience to the next generation who will never know what the beautiful New York skyline looked prior to September 11, 2001. You can watch live footage of the 9/11 ceremony via CNN by clicking here. They said there would only be a little over 400 people in attendance. They said people wouldn't come out because of the threat of a tropical storm. There were so many people, that they had to set up of overflow room. They said that the so-called bump from the Republican convention dampened the spirit of the Obama supporters. Saturday's rally proved them wrong. 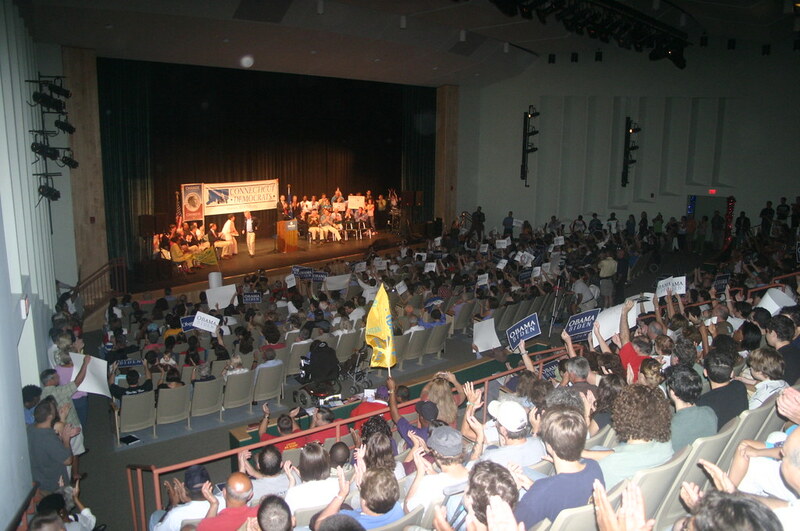 People from across the state descended on Hamden Middle School in to show their support for Barack Obama and Connecticut's Democratic delegation responded to the enthusiastic crowd with a healthy serving of red meat directed at George Bush the third. During the rally, the following video, put together by delegate Jen Just, caught the energy and excitement at the Democratic convention. Click here to see photos from the rally. If you want to view speeches from the rally in their entirety, click here. From the ONLY paper that has closely followed the Galante-Boughton connection (since 2005), here's a CRITICAL piece of info from their "Cappiello doesn't have a chance in hell in beating Chris Murphy" write-up. Christine Cappiello is now a health care lobbyist for Anthem Blue Cross Blue Shield, and Cappiello took some heat for failing to recuse himself from voting on an insurance pooling bill. His spokesman Adam Bauer said Cappiello voted only after getting the all-clear from the state ethics commission. The Courant points to something that going to be a HUGE problem for Nancy Johnson's 2006 re-election pitbull. A thornier potential problem may be Cappiello's connection to James Galante, a former Danbury trash hauler who pleaded guilty to racketeering, wire fraud and tax charges. Galante has been accused of making suspect $1,000 contributions in 2002 and 2003 to political action committees controlled by Cappiello, Boughton and DeLuca. Here's the latest excuse from Cappiello's mouthpiece Adam Bauer (and the person who's most likely responsible for STEALING my work for Cappiello's web ad) on Galante. Bauer says Cappiello was "misled" regarding the contributions. "David is focused on putting his message out there and letting the voters judge for themselves," Bauer said. Hmm...that's a rather different tune than what Cappiello stated when the news of the story broke last year. ...again, we'll get into that later. Finally, the Courant reminds us of Cappiello's fondness of Galante. In June, 2004, Cappiello wrote a glowing letter of support for Galante, extolling his charitable contributions and "exceptional personal character." "I am proud to call Jim my friend," Cappiello wrote. Remember, Cappiello made this remark about Galante AFTER the man with TIES TO THE MOB was WIDELY know to have served time in prison for tax evasion. REMEMBER: The State trial against Galante for giving ILLEGAL BUNDLED CAMPAIGN CONTRIBUTIONS to Mark Boughton, David Cappiello, and former state senator Lou DeLuca is scheduled to start anywhere from Sept 15 to sometime in October. ...then all the dirty laundry will come out (and the Hartford Courant, yours truly, and a bunch of other people who are rather interested in Cappiello will be right there is the court house to document all the juicy details). Today, the Jim Himes campaign released a new TV ad that takes direct aim at Chris Shays' ultra-close relation with the policies of President Bush (you know, the REPUBLICAN President that all the REPUBLICANS are running away from). If Chief Al Baker and Mayor Mark Boughton think public Taser demonstrations using volunteers are a great idea, they should offer themselves up as the volunteers who will be Tasered. 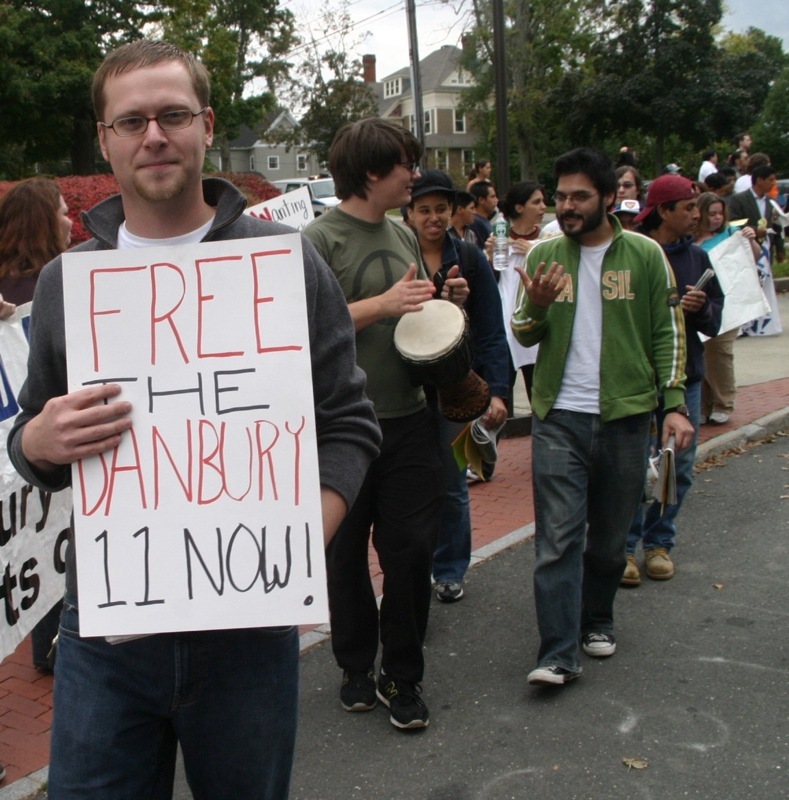 -News-Times' critique on the Danbury Police department's bizarre taser demonstration.